Today is the 17th anniversary of four coordinated terrorist attacks against the United States by the Islamic extremist group al-Queda. It was a day that changed America, honestly one that we will never forget. This photo of modern artist Jasper John’s flag is in the modern art gallery at Crystal Bridges Museum. 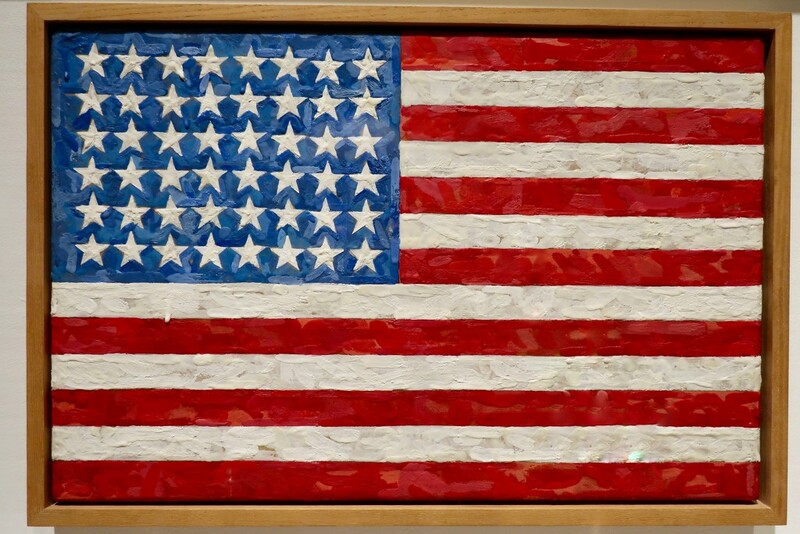 Johns had a dream in 1954 to paint a large American flag and woke up the next morning and gathered the materials to do just that. He had served in the U. S. Army two years prior to painting this. He said he planned to paint “easily recognizable, everyday items”, the flag is the painting he is best known for. I thought it would be a good photo for this solemn day for our country. Beautiful tribute for a day we will never forget. Wonderful remembrance shot and I agree, we will never forget. A beautiful painting and very appropriate tribute. One of those ‘what were you doing when?’ moments, like the Kennedy assassination, the fallmofnthe Berlin Wall, Princess Dianna’s death; 9/11 will echo through the hearts and memories of all Westerners for ever. RIP all who perished on that day, and the subsequent days because of it. I can't quite believe it & am rather ashamed that I have never heard one mention today on the news of the anniversary of this momentous day. Who could forget it....a world changing moment but people have short memories sadly! The best tribute! Trouble is I suppose we all have our win 9/11 these days, so many terror moments! Thoughtful tribute Lou Ann.....a time no=one should ever forget. This is an excellent tribute and symbol to commemorate such a tragic day- especially since so many took to flying the flag in the aftermath. Well done Lou Ann! @bkbinthecity @joansmor @pamknowler @henrir @gijsje @mittens @ludwigsdiana @ziggy77 @mave @carolmw @beryl @phil_sandford @pcoulson @happypat @happysnaps @olivetreeann @radiogirl Thank you all for your kind comments and favs. This is a hard day for all of us because we remember exactly what we were doing and who we were with and how shocked and heartbroken we all were. @happypat I had a friend who ended up staying in England several days past her vacation because all the planes were grounded. She always talks about how kind and supportive everyone was to her when they found out she was American. An excellent posting for today. @danette @365karly1 @milaniet @gilbertwood @4rky Thank you, I’m honored for this to be on the PP today. My goodness. it's still unbelievable what happened that day. i've been watching tapes of the news of that day and every time they show the planes crashing in, my hairs stand and i shiver. god bless america, indeed!